Stamping, like scrapbooking, is one of my favorite things to do. Also like scrapbooking, stamping can be downright addictive. You start out thinking you’re just going to buy a couple of stamps, and a few cards and things to use them with. The next thing you know, you’ve got drawers full of the stuff! Anyway, Christmas is one of my favorite times of the year to use rubber stamps. There are literally thousands of beautiful Christmas and holiday stamps available this time of year, so it’s very easy to go crazy if you’re not paying attention. #1 – Make your own Christmas cards. Yeah, I know this one is a no brainer. But, you might be surprised at how some blank art cards and envelopes can be transformed simply by using Christmas rubber stamps. #2 – Make your own gift tags. This is one of my favorites because you can get very creative. Plus, hand-made gift tags look so much more personal than those you can purchase at the store. I’ve even had friends and family keep the tags! #3 – Make your own wrapping paper. #4 – Make your own bookmarks. This is a great idea, particularly if the recipient is an avid reader. Also, they make great stocking stuffers. Most craft stores carry blank bookmarks, but even if you can’t find a store locally, you can find them online. There are also these wonderful plastic sleeves that you can buy to put the stamped bookmark in and protect them.You can purchase tassels that are very pretty, if you like as well. 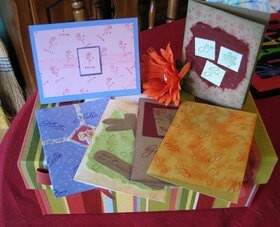 #5 – Make your own stationary set as a gift for someone. This is another great stocking stuffer! Knowing your recipient’s personal likes and dislikes can come in really handy here. For example, if your recipient is a dog lover, you could make a stationary set using stamps that feature dogs, and or items that relate to dogs. #6 – Make a personalized a journal. Know someone who buys a new journal every year? Why not purchase a completely blank journal (with no dates or anything inside), and then use your stamps to add the dates and small pictures that you know your recipient will love? This is great as a stocking stuffer or just a single gift. #7 – Make a pack of decorated Post-It notes. I use Post-it notes like crazy. I especially love the ones that have pictures and little sayings on them. I’ll bet you know someone just like that, so why not create your own set(s) of sticky notes for this person as a gift? Or, make some for yourself! #8 – Make a special picture frame. Just think about a photo that is special to your loved one, and then create a picture frame for it using your rubber stamps to decorate the frame. Nothing says “Christmas” like a beloved photo in a hand-made frame. 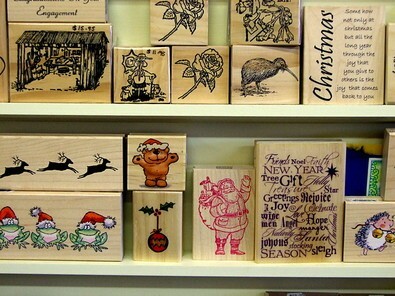 Rubber stamps give us a myriad of ideas for both gift giving and art making. All it takes is a little imagination and time, and you too can create something that will long be treasured by you and your loved ones.